The acoustic guitar market is flooded with a variety of budget models from different brands. From household names like Yamaha and Gibson to low-key names, you are spoiled for choice. If you are someone with an affinity for the underdogs, you might want to consider looking at Jasmine Guitars. Jasmine Guitars prides itself as a low-cost guitar maker with a commitment to improving design and quality. The Jasmine S35, in particular, is the quintessential model to represent the brand in the low-end entry-level category which is sold for less than a hundred bucks. If compared apples to apples with branded entry-level acoustic guitars in this price range, can this model go up against the stalwarts? Or, is it any less good than its counterparts? Find out. 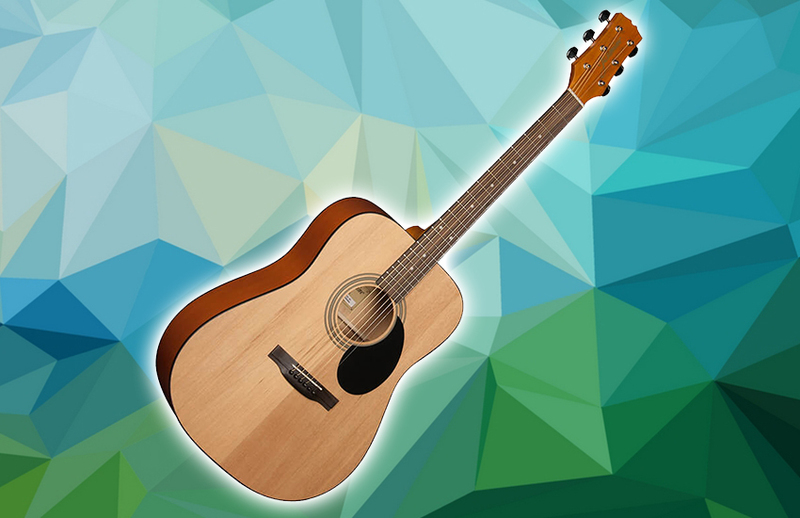 The Jasmine S35 features a 25.5-inch scale length dreadnought body. The X-braced top is made from laminated spruce, while the back and sides are made from laminated nato. The neck is also made from nato and houses smooth rosewood fretboard with 20 frets and a simple dot inlays. Both the body and the neck are coated in a satin finish. You see, there is nothing special about the tonewood as you would expect. But is this a deal-breaker? In this price range, no. In fact, many branded guitars have the same materials as the Jasmine S35. The difference is that the S35 is way more affordable. In the hardware department, you cannot expect anything fancy here either. Just like many other branded entry-level acoustic guitars, the components of this guitar are pretty standard yet reliable. The rosewood bridge comes with a synthetic bone compensated saddle and nut. Meanwhile, the headstock houses a set of chrome-coated tuners which is doing just fine out of the box. In the sound department, this is where the Jasmine S35 will surprise you. Despite not having an all solid wood build, the tone of the guitar is pretty balanced while the projection loud and crisp. It is not the onstage performance type of tone and projection, but it is more than what we expected. Remember, this is an entry-level model that is priced under $100. We bet even the advanced players would actually enjoy this beaut for casual strumming and fingerpicking. The Verdict: Should You Buy Jasmine S35? We have all the reasons to steer clear of musical instruments that are priced way below the standard market price. Somewhere, there are compromises that we might want to deal with in the long run. In the case of the Jasmine S35, it does not really make a difference from its branded counterparts. You have to take note that it is made from standard tonewood and basic components. So are the other acoustic guitars in this price range. The key difference is that Jasmine S35 will give you a run for your money. Therefore, Jasmine S35 is no less than any other models available on the market. 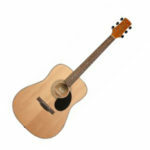 It is a no-frills budget-friendly acoustic guitar that any beginners would enjoy.